Video enhancements on tap from a variety of vendors. Video conferencing adoption is accelerating due to growing demand, reduced prices, and availability of cloud-based meeting and interoperability services, as Irwin Lazar, VP and service director at Nemertes Research, shared in his recent No Jitter post on the firm's recent findings. And if that adoption data holds true, enterprises have plenty of new offerings to consider for video-enabling their collaborative work spaces. With the AV industry's InfoComm event taking place next week, video vendors have been busy getting the word our on their latest news. Here's some of what we've heard so far. 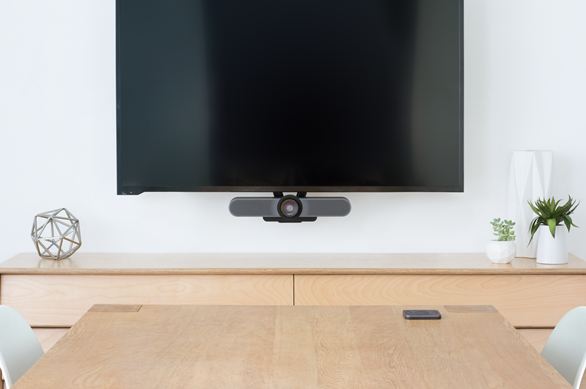 A couple weeks back, Polycom and Zoom announced a partnership, introducing the Zoom Connector for Polycom, which allows Polycom video solution users one-click access to Zoom meetings. At the time of that announcement, Karthik Arumugam, VP strategy and business development at Polycom, took the time to go over some of the biggest barriers to video conferencing adoption. Top of the list was complexity. If that's the case, then today's announcement from Polycom is likely to continue breaking down these barriers, as it aims for easy set-up and configuration. Pano can connect to any display to enable wireless content sharing, and works with PCs, Macs, tablets, and smartphones. Pano has strict security safeguards, requiring users to enter a security PIN to enter each session, limiting content sharing to a designated target monitor, and preventing local storage of shared information. Users, however, can save annotations to Google Drive or other cloud repository. "Think about how you share content today," Sexton said. "Today most presenters will put a piece of content up and pass the cable to take turns. Pano allows them to move beyond a single cable experience." The majority of enterprises do not have touch-enabled environments, Sexton said. As the price of touch screens comes down further, enterprises will likely transition, but since we are not yet at that point, Polycom designed Pano to work with legacy user devices. For annotation, a mouse plugs into a USB port and serves as a "writing" tool, Sexton explained. Pano, available immediately in 138 countries, is priced at $1,990. Last we heard from Logitech in February, it had just introduced Brio, its advanced webcam with 4K image sensors, facial recognition capabilities and more. Now Logitech is moving from the desktop into small rooms, today unveiling MeetUp, a huddle room conferencing cam. MeetUp features a 120-degree field of view, which nicely fits in view everyone seated at a small table, as Logitech's Joan Vandermate, head of marketing, Collaboration Business Unit, recently showed me in a demo. Additionally, the camera can pan another 25 degrees to the left and right, offering 170 degrees total of any given room. The camera features three beamforming, omnidirectional microphones featuring noise and echo cancellation. These microphones are certified to work with Microsoft Cortana to accept voice commands. For use in larger rooms, Logitech offers an optional expansion microphone for MeetUp. 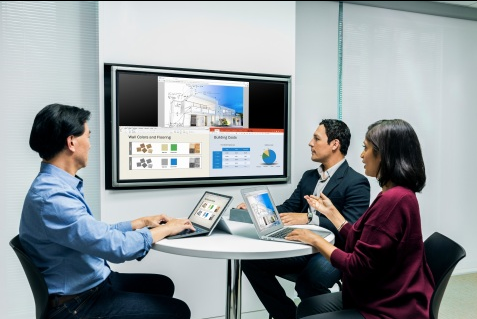 MeetUp, which will be available in July for $899, will work with most any video conferencing software application or cloud service, including Microsoft Skype for Business and Cisco WebEx, Logitech said. Separately, Logitech introduced a mobile app that can turn any Android or iOS smartphone into a soft remote for all Logitech video conferencing products.